"This unique concoction was inspired by my family's tradition of eating peanut butter sandwiches with a bowl of chili. The combination of bold chili, creamy peanut butter with a flaky buttery crust is very complimentary and will be sure to become an instant family favorite." Whisk together the flour, sugar, and salt in a mixing bowl. Cut in the cold butter with a knife or pastry blender until the mixture resembles coarse crumbs. (This can also be done in a food processor: pulse the cold butter until it's the size of small peas. Turn mixture into a bowl and proceed.) Add the ice water a tablespoon at a time, tossing with a fork, until the flour mixture is moistened. 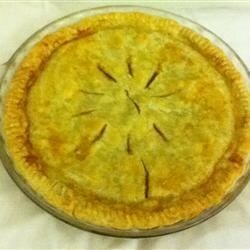 Do not add more water than you need: when you squeeze a handful of the moistened pastry mixture, it should form a ball. Divide the dough in half and shape into balls. Wrap in plastic and refrigerate for at least 1 hour or up to three days. Roll one ball out to fit a 9 inch pie plate. Place bottom crust in pie plate and chill for at least 20 minutes before baking. Roll out top crust and set aside. Spread melted peanut butter onto the pie crust. Pour the chili on top, then arrange the top crust over the chili. Press the edges of the bottom and top crusts together to seal, then brush with egg. Make several cuts into the top crust to vent. Bake in the preheated oven until golden brown, about 50 minutes. Cover the edge of the pie with aluminum foil if it begins to brown too quickly.